Her rich dress and jewels show that this woman was of high rank, although her identity is unclear. Her most notable piece of jewellery is the cameo suspended on a black ribbon. It shows the figure of Prudence, one of the cardinal virtues and considered then an especially appropriate quality in a woman. The remains of an inscription, upper right, date the picture to between 1565 and 1568. The large heraldic arms were added later; they belonged to Lady Eleanor Brandon, but she cannot be the woman depicted because she had died in 1547, around 20 years before this was painted. …; Vernon-Wentworth family, Wentworth Castle, Barnsley, Yorkshire, by 1866; sold by Capt. B.C. Vernon-Wentworth, Christie’s 13 November 1919 (54 as ‘Portrait of Lady Eleanor Brandon’) bought F. Howard, sold to Marmaduke, 1st Viscount Furness; descended in the family until anonymous sale, Sotheby’s 15 July 1984 (256); purchased by Tate. The identity of this sitter remains unclear, although her opulent attire and jewellery indicate that she is of extremely high rank. The large coat of arms was added perhaps as much as a century later, and cannot refer to the sitter herself. It had been borne by Henry Clifford, 2nd Earl of Cumberland and by his wife Eleanor Brandon, who accordingly was long thought to be the subject of the portrait. 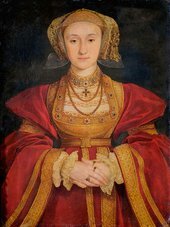 She, however, died in 1547, about twenty years before the date of this painting. Later it was thought that the sitter might be this couple’s only child, Margaret Clifford (1540–1596) who married Henry Stanley, Lord Strange, later 4th Earl of Derby, in 1555. At some time prior to 1866, a 75 mm strip was removed from the right-hand side of the painting and part of the inscription was consequently lost. As a result, while the truncated Roman numerals can refer only to 1565–8, the age of the sitter is now unknown. Eleanor Brandon was the daughter of Henry VIII’s sister Mary, who had briefly been married to Louis XII of France. Her descendants thus had a claim to the English throne. Sir Roy Strong suggested that the ladies portrayed might be two of the three daughters of Thomas, 1st Baron Wentworth of Nettlestead (1501–1551): Jane (died 1614), Margaret (died 1587) and Dorothy.3 Each married advantageously more than once, although the exact wedding dates are not known. The three-quarter-length composition in which a female sitter, her hands at waist-level, loops up a prized and valuable object on a chain or ribbon to present it to the viewer’s gaze, was also popular in the Low Countries. Eworth used it for other portraits in the 1560s, and it is seen in various works of the same decade by his contemporary artists in England, many of whom are not now known by name. The sitter’s remarkable open balloon ‘wings’ at the shoulders – a short-lived fashion of the late 1560s – appear as a fantastical Mannerist touch. The sitter’s fine jewellery includes a pendant at her throat with a cabochon ruby, and one large lozenge and three table-cut diamonds in an enamelled gold setting with acanthus scrolls and classical figures and a pearl knop at its base (Dr Yvonne Hackenbroch suggests that this may be French). The double gold chain is made up of enamelled oblong links set with pearls, alternating with pomanders caged in gold. The lady’s cap and dress are studded with jewelled buttons and pearls and she wears a pearl and ruby bracelet on each wrist. The panel itself is made up from three vertical oak members, the right-hand one having been cut down as described above. The approximate original proportions have been reconstructed by placing a loose strip of wood in the frame to represent the missing section. An unfaded strip of paint protected by the frame along the bottom shows that the red of the pearl-studded dress was originally a much deeper shade of rose madder. The background, on the other hand, was probably originally lighter and seems to have been covered by a layer of dark brown paint quite early in the painting’s history. It appears that a space for a coat of arms was reserved in the background, where it can be seen as a smaller, blank shield under the present elaborate cartouche. When photographed for the 1866 exhibition, the portrait bore a painted label, bottom left. Illegible in the photograph, all trace of this had vanished by 1984. 1 Lorne Campbell, ‘Holbein’s Miniature of “Mrs Pemberton”’, Burlington Magazine, vol.129, no.1011, 1987, p.369. 2 Art Institute of Chicago, see Roy Strong, The English Icon: Elizabethan & Jacobean Portraiture, London 1969, p.96, no.38. 3 Sir Roy Strong, letter to Tate, 7 January 1986, Tate catalogue files. 4 Sold at Sotheby’s, 1 December 1983 (288). The theme was not uncommon in emblematic jewellery at this time, see Yvonne Hackenbroch, Renaissance Jewellery, London 1979, pp.90-1. Diana Scarisbrick and Shirley Bury also kindly advised on the jewellery in the present painting.